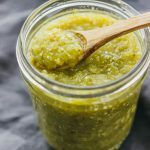 Salsa verde is a green tomatillo sauce that is pureed and then cooked on the stove. Add all of the ingredients to a food processor. Puree for 20 seconds or until combined, pausing halfway to scrape down the sides of the processor bowl. Transfer the contents from the food processor to a small pot. Bring to a simmer over medium-high heat. Simmer for 5 minutes, stirring frequently, reducing the heat as needed to maintain the simmer. The mixture should darken in color as it cooks. Let the mixture cool. Transfer to a lidded container and refrigerate until ready to serve.